The Great Coat And Tie Experiment: Boring Week! So far this week I've been bored with my boring choices for conglomerations. Today's is no exception. Safe, tried and true black and white. But wait! I did add a red necktie! How daring! I'm a little scared that I might be suffering from conglomeration block. Maybe I'm snugging my neckwear a little too snuggly. Oh well, on to today's "conglomeration", if it can actually be called that. White pinpoint straight collar dress shirt. The one thing I really like about this shirt is that the stitching on the collar is at the edge rather than a quarter inch in or so. It gives the collar more of a finished look to me. I have a few like this that Paul Fredrick calls a European straight collar. The tie space seems to be a bit less with this collar so I usually wear a less substantial necktie. Not today though. Today I selected yet another woven Jos A. Bank Signature number. It has what look like smooshed ovals in grey and also in the background color. It's almost Escher-esque in its presentation and one of the reasons I acquired it. In the center of each gray smoosh is a black square. It really made it easy to pick which sportcoat to wear. Yeah, the black one. 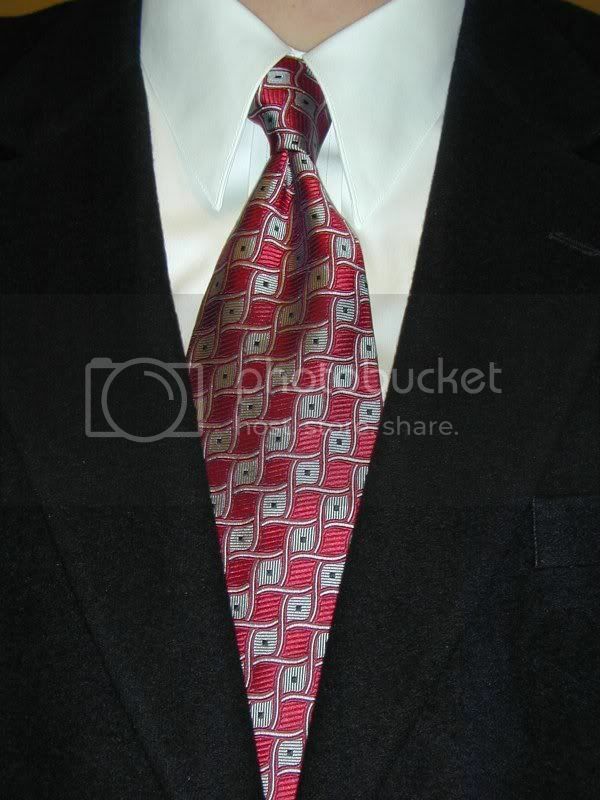 Speaking of Escher and ties, I've long considered getting a few. This site has a few that would suit me. Maybe I should really shake things up and get a bow tie. That would get me laughed right out of here. Yes, I do know how to knot a bow tie. I've got two but have yet to muster the courage to sport one outside of the safety of home. That, according to most bow tie folks that I've read, automatically excludes me from being a bow tier.